Orca Gold Granted Water Permit for | Orca Gold Inc.
VANCOUVER, BRITISH COLUMBIA--(Marketwired - Feb. 7, 2018) - Orca Gold Inc. (TSX VENTURE:ORG)("Orca" or the "Company") is pleased to report that it has received from the Government of The Republic of The Sudan an exclusive permit for the exploitation of water from the Area 5 aquifer (the "Water Permit"), first discovered by the Company in May 2017 (see Company News Release dated May 30, 2017). The Water Permit is a strategic permit in the development of a gold mine on Block 14. It entitles the Company to extract the necessary water to support a 6 Mtpa mining and processing operation, which is the basis of the Feasibility Study in progress. The Water Permit covers an area of 980km2. Through drilling and pump testing, Orca defined a resource of 100 million cubic metres of fresh water within an area of 135km2. The aquifer is open in all directions and would be available for additional production, if required (See Figure 1). Commenting on the receipt of the Water Permit, Rick Clark, CEO and Director of Orca said: "A determining factor in developing a mine in the desert, in addition to finding an ore body, is water. With the granting of this exclusive water rights over the Area 5 aquifer, the Government of Sudan has confirmed its full support of Orca and the development of a commercial gold operation at Block 14. With this key permit, we will now move towards the completion of a Feasibility Study, which contemplates a processing operation of 6 Mtpa. As we continue to expand the gold resources at Block 14 through ongoing drilling, we look forward to delivering the results of the Feasibility Study based on this robust water supply." Orca Gold Inc. (TSX VENTURE:ORG) is a Canadian resource company focused on exploration opportunities in Africa, where it is currently focused on its 70%-owned Block 14 Gold Project in the Republic of the Sudan. 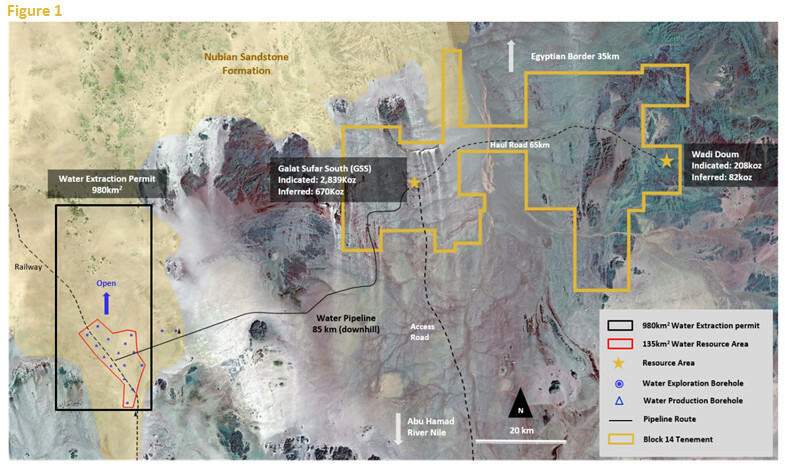 Block 14 is situated on a 2,170 km2 concession. The Company is currently conducting a Feasibility Study on the project.